Hürthle cell carcinoma of the thyroid gland is an unusual and relatively rare type of differentiated thyroid cancer. Hürthle cell cancer accounts for only about 3-10% of all differentiated thyroid cancers; therefore, few institutions have extensive experience with Hürthle cell neoplasms. According to the World Health Organization (WHO), these neoplasms are considered a variant of follicular carcinoma of the thyroid and are referred to as follicular carcinoma, oxyphilic type. See the image below. Some investigators believe that this condition is distinct from other follicular cell neoplasms. Hürthle cells are observed in both neoplastic and nonneoplastic conditions of the thyroid gland (eg, Hashimoto thyroiditis, nodular and toxic goiter). Oncocytic cells in the thyroid are often called Hürthle cells, and oncocytic change is defined as cellular enlargement characterized by an abundant eosinophilic granular cytoplasm as a result of accumulation of altered mitochondria. This is a phenomenon of metaplasia that occurs in inflammatory disorders, such as thyroiditis, or other situations that result in cellular stress. The proliferation of oncocytes gives rise to hyperplastic and neoplastic nodules. The cytological features for Hürthle cell neoplasms are hypercellularity with a predominance of Hürthle cells (usually >75%), few or no lymphocytes, and scanty or absent colloid. Hürthle cells were first described by Askanasy in 1898, in patients with Graves disease; however, these cells were mistakenly named for the German physiologist Karl Hürthle, who actually described the interfollicular C-cell. Hürthle cells are large and polygonal in shape, with indistinct cell borders. They have a large pleomorphic hyperchromatic nucleus, a prominent nucleolus, and intensely pink, fine, granular cytoplasm with hematoxylin-eosin staining. Hürthle cells are also found in other tissues, such as the salivary gland, parathyroid gland, esophagus, pharynx, larynx, trachea, kidney, pituitary, and liver. Controversy exists about the origin of Hürthle cells, which generally are thought to derive from the follicular epithelium. A Hürthle cell neoplasm is defined generally as an encapsulated thyroid lesion comprising at least 75% Hürthle cells. A benign neoplasm cannot be distinguished from a malignant neoplasm on the basis of cytologic analysis of fine-needle aspiration (FNA) biopsy. Features such as pleomorphism, anaplasia, hyperchromatism, and atypia are also observed in benign follicular adenomas; therefore, definitive differentiation of Hürthle cell carcinoma from Hürthle-cell adenoma is based on vascular invasion and/or capsular invasion, as well as on permanent histologic sections or extrathyroidal tumor spread and lymph node and systemic metastases. In the literature, the incidence of malignancy in Hürthle-cell neoplasms is variable, ranging from 13-67%. Overall, only about 33% of Hürthle cell tumors demonstrate signs of that invasive growth that indicates malignancy and the possibility of metastasizing. On balance, Hürthle cell tumors may be considered to be more likely to metastasize than follicular tumors. The likelihood of nodal metastases is greater in Hürthle cell tumors than in follicular tumors; it is, however, not as great as with papillary tumors. Permissive histologic interpretation may result in the designation of some non-neoplastic Hürthle cell lesions as malignant tumors. Obviously, this factor has a major impact in interpreting the natural history of this disease and adds to the controversy about the aggressiveness of Hürthle cell carcinoma. This leads to reported overall mortality rates ranging from 9-28%. Tumor size is an important feature for biological behavior. A 1988 study found that a Hürthle tumor that is 4 cm or larger has an 80% chance of histologic evidence of malignancy. In another study by Pisanu et al,  in a series of 23 patients, the mean tumor size was significantly greater for carcinomas than adenomas (3.1 cm vs 1.9 cm). Hürthle cell cancer has the highest incidence of metastasis among the differentiated thyroid cancers. Metastatic disease is reported at the time of initial diagnosis in 10-20% of patients and in 34% of the patients overall. Metastasis usually occurs hematogenously, but lymph node metastasis is also not uncommon and typically involves the regional lymph nodes. Some studies suggest that lymph node metastases at initial diagnosis may not be an unfavorable prognostic factor. The lungs, bones, and central nervous system are the most prevalent sites of metastases. No widely accepted paradigm exists for the pathogenesis of follicular and Hürthle cell cancer of the thyroid. Some evidence suggests that a multistep adenoma-to-carcinoma pathway may be involved; however, this concept is not universally accepted. Many of the cells probably develop from preexisting adenomas, but a follicular carcinoma in situ is not recognized pathologically. Progressive transformation through somatic mutations of genes that are important in growth control are involved in follicular thyroid cancer formation. Low iodide intake is a key environmental factor determining the relative incidence of follicular and papillary cancers. Most follicular adenomas and all follicular carcinomas are thought to have monoclonal origin. Oncogene activation, particularly by mutation or translocation of the ras oncogene, is common in both follicular adenomas and follicular thyroid carcinomas (around 40%), supporting a role in early tumorigenesis. Such ras oncogene mutations are not specific for follicular tumors and also occur in papillary thyroid cancer (PTC). The ras oncogene is frequently involved in the pathogenesis of Hürthle cell tumors. In papillary thyroid cancers and in many Hürthle cell tumors, RET rearrangements are found; these are not found in follicular tumors. Local spread may be found in RET-positive cases; RET-negative cases, as in follicular cancer cases, are more likely to spread through the bloodstream to distant metastatic sites. An association also was found between overexpression of the p53 gene product and a subset of Hürthle cell carcinomas. Reduced immunoexpression of E-cadherin exists, with a trend to a diffuse cytoplasmic pattern, both in benign and malignant Hürthle cell tumors and in papillary, poorly differentiated, and undifferentiated thyroid carcinomas. Isolated studies indicate overexpression of the N-myc oncogene, tumor growth factor (TGF)-alpha, TGF-beta, insulinlike growth factor (IGF)-1, and somatostatin receptor in Hürthle cell carcinomas. Cytogenetic abnormalities and evidence of genetic loss are more common in follicular thyroid cancer than in papillary thyroid cancer. These abnormalities occur in follicular adenomas, suggesting that cell cycle control, mitotic spindle formation, DNA repair, or more than one of these mechanisms may be impaired in these neoplasms, possibly at an earlier stage. Activating mutations of genes encoding the thyrotropin receptor and the alpha subunit of the stimulatory G protein are also reported in some follicular carcinomas. These losses are associated particularly with chromosomes 3, 10, 11, and 17. The deletions and/or rearrangements involving the p (short) arm of chromosome 3 are the most common. Loss of a tumor suppressor on chromosome arm 3p has been postulated to be specific for follicular thyroid cancer and may be involved in adenoma-to-carcinoma progression. Restriction fragment length polymorphism (RFLP) analysis demonstrates that unbalanced losses of genetic material are relatively common in Hürthle cell neoplasms. Loss of heterozygosity from the q (long) arm of chromosome 10 is also detected in oncocytic tumors. Evidence suggests that some Hürthle cell adenomas and carcinomas can express an RET/PTC gene arrangement, which is more unique to papillary thyroid carcinoma. Mitochondrion-related alterations, such as mutations in mitochondrial DNA, are also described in Hürthle cell tumors. Defects of cytochrome c oxidase and the deletion of mitochondrial DNA occur frequently in Hürthle cell tumors and in Hürthle cells of Hashimoto thyroiditis. In one study, almost all Hürthle cells displayed a common deletion, somatic mitochondrial point mutations, or both. Activating gene mutations encoding the thyrotropin receptor and the alpha subunit of the stimulatory G protein are also reported in some follicular carcinomas. DNA content profiles after flow cytometry are commonly abnormal. 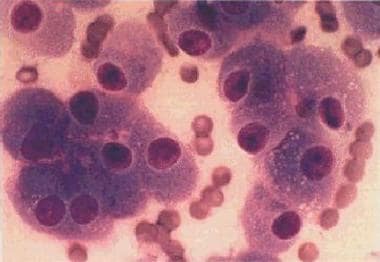 Hürthle cell neoplasms, including histologically benign tumors, are often aneuploid. This finding parallels with nuclear atypia and anisocytosis. The demonstration of aneuploidy may be a marker for a particularly aggressive clinical behavior compared with euploid tumors. In a recent Italian study, p27 and cyclin D3 proteins were found to be overexpressed in Hürthle cell carcinoma cell lines and clinical samples of thyroid cancer. The accumulation of p27 was found to be associated to the overexpression of cyclin D3 in Hürthle cell carcinoma of the thyroid. Worldwide, thyroid cancer rates have been increasing over the past few decades. International frequency likely approximates that of the United States. In general, the annual incidence of thyroid cancer in various parts of the world is 0.5-10 cases per 100,000 population. As in the US, approximately 3%-10% of these cases are Hürthle cell carcinomas. Hürthle cell cancer reportedly behaves in a more aggressive fashion than other well-differentiated thyroid cancers, with a tendency to higher frequency of metastasis and a lower survival rate. This is truer for the lesions that are clearly demonstrated to be malignant and in patients who are considered to be at high risk based on such factors as age, tumor size, invasiveness, and the presence of metastasis. Widely invasive tumors behave more aggressively. Recurrent Hürthle cell carcinomas are considered to be incurable. Mortality rates vary in different series, based on the staging systems used, which consider the patient's age, tumor size, extrathyroidal tumor spread, pathologic classification of the neoplasm (Hürthle cell carcinoma versus adenoma), and the therapeutic approach. Morbidity depends on the behavior of the Hürthle cell carcinoma. All races appear to be affected equally. The typical age range of patients presenting with this condition is 20-85 years. The mean age is usually 50-60 years, approximately 10 years older than the age associated with other types of differentiated thyroid cancers. Asa SL. My approach to oncocytic tumours of the thyroid. J Clin Pathol. 2004 Mar. 57(3):225-32. [Medline]. Cannon J. The significance of hurthle cells in thyroid disease. Oncologist. 2011. 16 (10):1380-7. [Medline]. [Full Text]. Bronner MP, Clevenger CV, Edmonds PR, Lowell DM, McFarland MM, LiVolsi VA. Flow cytometric analysis of DNA content in Hürthle cell adenomas and carcinomas of the thyroid. Am J Clin Pathol. 1988 Jun. 89(6):764-9. [Medline]. Pisanu A, Sias L, Uccheddu A. Factors predicting malignancy of Hürthle cell tumors of the thyroid: influence on surgical treatment. World J Surg. 2004 Aug. 28(8):761-5. [Medline]. Stojadinovic A, Ghossein RA, Hoos A, Urist MJ, Spiro RH, Shah JP. Hürthle cell carcinoma: a critical histopathologic appraisal. J Clin Oncol. 2001 May 15. 19(10):2616-25. [Medline]. Strazisar B, Petric R, Sesek M, Zgajnar J, Hocevar M, Besic N. Predictive factors of carcinoma in 279 patients with Hürthle cell neoplasm of the thyroid gland. J Surg Oncol. 2010 Jun 1. 101(7):582-6. [Medline]. Guerrero MA, Suh I, Vriens MR, Shen WT, Gosnell J, Kebebew E, et al. Age and tumor size predicts lymph node involvement in Hürthle Cell Carcinoma. J Cancer. 2010 Jun 2. 1:23-6. [Medline]. [Full Text]. Maxwell EL, Palme CE, Freeman J. Hürthle cell tumors: applying molecular markers to define a new management algorithm. Arch Otolaryngol Head Neck Surg. 2006 Jan. 132(1):54-8. [Medline]. Máximo V, Sobrinho-Simões M. Hürthle cell tumours of the thyroid. A review with emphasis on mitochondrial abnormalities with clinical relevance. Virchows Arch. 2000 Aug. 437(2):107-15. [Medline]. Troncone G, Iaccarino A, Russo M, Palmieri EA, Volante M, Papotti M, et al. Accumulation of p27(kip1) is associated with cyclin D3 overexpression in the oxyphilic (Hurthle cell) variant of follicular thyroid carcinoma. J Clin Pathol. 2007 Apr. 60(4):377-81. [Medline]. Ganly I, Ricarte Filho J, Eng S, et al. Genomic dissection of Hurthle cell carcinoma reveals a unique class of thyroid malignancy. J Clin Endocrinol Metab. 2013 May. 98(5):E962-72. [Medline]. Cancer Facts & Figures 2017. American Cancer Society. Available at https://www.cancer.org/content/dam/cancer-org/research/cancer-facts-and-statistics/annual-cancer-facts-and-figures/2017/cancer-facts-and-figures-2017.pdf. Accessed: September 20, 2017. Ghossein RA, Hiltzik DH, Carlson DL, Patel S, Shaha A, Shah JP, et al. Prognostic factors of recurrence in encapsulated Hurthle cell carcinoma of the thyroid gland: a clinicopathologic study of 50 cases. Cancer. 2006 Apr 15. 106(8):1669-76. [Medline]. Cooper DS, Schneyer CR. Follicular and Hürthle cell carcinoma of the thyroid. Endocrinol Metab Clin North Am. 1990 Sep. 19(3):577-91. [Medline]. Kushchayeva Y, Duh QY, Kebebew E, Clark OH. Prognostic indications for Hürthle cell cancer. World J Surg. 2004 Dec. 28(12):1266-70. [Medline]. Besic N, Schwarzbartl-Pevec A, Vidergar-Kralj B, Crnic T, Gazic B, Marolt Music M. Treatment and outcome of 32 patients with distant metastases of Hürthle cell thyroid carcinoma: a single-institution experience. BMC Cancer. 2016 Feb 26. 16 (1):162. [Medline]. Máximo V, Botelho T, Capela J, Soares P, Lima J, Taveira A, et al. Somatic and germline mutation in GRIM-19, a dual function gene involved in mitochondrial metabolism and cell death, is linked to mitochondrion-rich (Hurthle cell) tumours of the thyroid. Br J Cancer. 2005 May 23. 92(10):1892-8. [Medline]. Pryma DA, Schoder H, Gonen M, Robbins RJ, Larson SM, Yeung HW, et al. Diagnostic accuracy and prognostic value of 18F-FDG PET in Hurthle cell thyroid cancer patients. J Nucl Med. 2006 Aug. 47(8):1260-6. [Medline]. Elliott DD, Pitman MB, Bloom L, Faquin WC. Fine-needle aspiration biopsy of Hurthle cell lesions of the thyroid gland: A cytomorphologic study of 139 cases with statistical analysis. Cancer. 2006 Apr 25. 108(2):102-9. [Medline]. Jacques C, Guillotin D, Fontaine JF, et al. DNA microarray and miRNA analyses reinforce the classification of follicular thyroid tumors. J Clin Endocrinol Metab. 2013 May. 98(5):E981-9. [Medline]. Alexander EK, Kennedy GC, Baloch ZW, Cibas ES, Chudova D, Diggans J, et al. Preoperative diagnosis of benign thyroid nodules with indeterminate cytology. N Engl J Med. 2012 Aug 23. 367(8):705-15. [Medline]. Donatini G, Beaulieu A, Castagnet M, Kraimps JL, Levillain P, Fromont G. Thyroid Hürthle cell tumors: research of potential markers of malignancy. J Endocrinol Invest. 2016 Feb. 39 (2):153-8. [Medline]. Volante M, Bozzalla-Cassione F, DePompa R, Saggiorato E, Bartolazzi A, Orlandi F, et al. Galectin-3 and HBME-1 expression in oncocytic cell tumors of the thyroid. Virchows Arch. 2004 Aug. 445(2):183-8. [Medline]. Jillard C, Youngwirth L, Scheri R, Roman S, Sosa JA. Radioactive Iodine Treatment is Associated with Improved Survival for Patients with Hürthle Cell Carcinoma. Thyroid. 2016 May 5. [Medline]. Fernández CA, Puig-Domingo M, Lomeña F, Estorch M, Camacho Martí V, Bittini AL, et al. Effectiveness of retinoic acid treatment for redifferentiation of thyroid cancer in relation to recovery of radioiodine uptake. J Endocrinol Invest. 2009 Mar. 32(3):228-33. [Medline]. Kim WG, Kim EY, Kim TY, Ryu JS, Hong SJ, Kim WB, et al. Redifferentiation therapy with 13-cis retinoic acids in radioiodine-resistant thyroid cancer. Endocr J. 2009 Mar. 56(1):105-12. [Medline]. Foote RL, Brown PD, Garces YI, McIver B, Kasperbauer JL. Is there a role for radiation therapy in the management of Hürthle cell carcinoma?. Int J Radiat Oncol Biol Phys. 2003 Jul 15. 56(4):1067-72. [Medline]. Zavitsanos P, Amdur RJ, Drew PA, Cusi K, Werning JW, Morris CG. Favorable Outcome of Hurthle Cell Carcinoma of the Thyroid Treated With Total Thyroidectomy, Radioiodine, and Selective Use of External-Beam Radiotherapy. Am J Clin Oncol. 2017 Aug. 40 (4):433-437. [Medline]. Haugen BR, Sherman SI. Evolving approaches to patients with advanced differentiated thyroid cancer. Endocr Rev. 2013 Jun. 34(3):439-55. [Medline]. [Full Text]. Younes MN, Yigitbasi OG, Park YW, Kim SJ, Jasser SA, Hawthorne VS, et al. Antivascular therapy of human follicular thyroid cancer experimental bone metastasis by blockade of epidermal growth factor receptor and vascular growth factor receptor phosphorylation. Cancer Res. 2005 Jun 1. 65(11):4716-27. [Medline]. Younes MN, Yazici YD, Kim S, Jasser SA, El-Naggar AK, Myers JN. Dual epidermal growth factor receptor and vascular endothelial growth factor receptor inhibition with NVP-AEE788 for the treatment of aggressive follicular thyroid cancer. Clin Cancer Res. 2006 Jun 1. 12(11 Pt 1):3425-34. [Medline]. Paphavasit A, Thompson GB, Hay ID, Grant CS, van Heerden JA, Ilstrup DM, et al. Follicular and Hürthle cell thyroid neoplasms. Is frozen-section evaluation worthwhile?. Arch Surg. 1997 Jun. 132(6):674-8; discussion 678-80. [Medline]. [Guideline] NCCN Clinical Practice Guidelines in Oncology: Thyroid Carcinoma. National Comprehensive Cancer Network. Available at http://www.nccn.org/professionals/physician_gls/pdf/thyroid.pdf. Version 2.2017 — May 17, 2017; Accessed: September 20, 2017. [Guideline] Gharib H, Papini E, Garber JR, Duick DS, Harrell RM, Hegedüs L, et al. AMERICAN ASSOCIATION OF CLINICAL ENDOCRINOLOGISTS, AMERICAN COLLEGE OF ENDOCRINOLOGY, AND ASSOCIAZIONE MEDICI ENDOCRINOLOGI MEDICAL GUIDELINES FOR CLINICAL PRACTICE FOR THE DIAGNOSIS AND MANAGEMENT OF THYROID NODULES--2016 UPDATE. Endocr Pract. 2016 May. 22 (5):622-39. [Medline]. [Full Text]. Mills SC, Haq M, Smellie WJ, Harmer C. Hürthle cell carcinoma of the thyroid: Retrospective review of 62 patients treated at the Royal Marsden Hospital between 1946 and 2003. Eur J Surg Oncol. 2009 Mar. 35(3):230-4. [Medline]. Goffredo P, Roman SA, Sosa JA. Hurthle cell carcinoma: a population-level analysis of 3311 patients. Cancer. 2013 Feb 1. 119(3):504-11. [Medline]. Oluic B, Paunovic I, Loncar Z, Djukic V, Diklic A, Jovanovic M, et al. Survival and prognostic factors for survival, cancer specific survival and disease free interval in 239 patients with Hurthle cell carcinoma: a single center experience. BMC Cancer. 2017 May 25. 17 (1):371. [Medline]. [Full Text]. Tumor, lymph node, metastases (TNM) staging system for papillary and follicular thyroid carcinoma.